Ditcheat is a village and civil parish 4.5 miles (7 km) south of Shepton Mallet, and 2.5 miles (4 km) north-west of Castle Cary, in the Mendip district of Somerset, England. The parish of Ditcheat incorporates three hamlets: Wraxall, Alhampton and Sutton. In the Domesday book of 1086, Ditcheat belonged to Glastonbury Abbey and contained 36 families. The parish of Ditcheat was part of the Whitstone Hundred. Its primary infrastructure connections consist of the A37, 1.5 miles (2 km) west, connecting Bristol and Yeovil or the A371, 1 mile (2 km) east, connecting Shepton Mallet and Wincanton. It is situated near the River Brue which is crossed by Ansford bridge which dates from 1823. Boulter's Bridge which spans the River Alham is of medieval origin and has been designated as a Scheduled Ancient Monument. The parish is close to the Roman Fosse Way. The village falls within the Non-metropolitan district of Mendip, which was formed on 1 April 1974 under the Local Government Act 1972, having previously been part of Shepton Mallet Rural District, who are responsible for local planning and building control, local roads, council housing, environmental health, markets and fairs, refuse collection and recycling, cemeteries and crematoria, leisure services, parks, and tourism. The Church of St Mary Magdalene has 12th-century origins. It has been designated by English Heritage as a Grade I listed building. The Abbey is a large house (formerly known as The Priory), built as the rectory by John Gunthorpe who was rector of Ditcheat, Dean of Wells and Lord Privy Seal, in 1473. The house was altered in 1667 for Christopher Coward; and given a new facade and rearranged internally in 1864–68, probably by James Piers St Aubyn for Rev. William Leir. The exterior is now mostly his Victorian neo-Tudor; inside there are reused fragments and some original 15th- and 17th-century work – coffered ceilings and the arch-braced roof of the ‘chapel wing’, but most of the elaborate Gothic work dates from the 1860s. Priors Leigh on the Alhampton Road is a former chapel, now a private home. Ditcheat is home to the stables operated by Paul Nicholls, trainer of Cheltenham Gold Cup-winning horses Kauto Star and Denman. 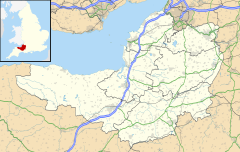 ^ "Ditcheat Parish". Neighbourhood Statistics. Office for National Statistics. Retrieved 1 January 2014. ^ Havinden, Michael. The Somerset Landscape. The making of the English landscape. London: Hodder and Stoughton. p. 97. ISBN 0-340-20116-9. ^ "Somerset Hundreds". GENUKI. Retrieved 22 October 2011. ^ "Ansford Bridge". Images of England. Retrieved 20 March 2008. ^ "Boulter's Bridge". Images of England. Retrieved 20 March 2008. ^ "Boulters Bridge". Listed Buildings Online. English Heritage. Retrieved 2 January 2011. ^ "Ditcheat House, or Ditcheat Manor". Images of England. Retrieved 20 March 2008. ^ "Church of St Mary Magdalene". Images of England. Retrieved 20 March 2008. ^ "The Priory". Images of England. Retrieved 20 March 2008. ^ "Priors Leigh" (PDF). Chesterton Humberts. ^ "Gold Cup winner in village parade". BBC News. 14 March 2009. Retrieved 15 March 2009. Wikimedia Commons has media related to Ditcheat.